The Origami Forum • View topic - Size of folds for earrings? I was asked to make folds for a pair of earrings. It's my first time. Have any of you made origami earrings? What should the final size of the folds be? Last edited by Gerardo on November 11th, 2017, 1:25 pm, edited 2 times in total. Re: Size of folds for earrings? Yes, I have, sort of. I used two yellow half squares about as long and thick as a sticky note, then pleated them into 1/8 strips and curled them into rings. I applied MC to keep it's shape, and in the morning "wore" it to school for "wacky day." The size was about 2 centimeters in diameter, which worked fine, but my ears aren't pierced and I had to balance one end into my ear and hoped it looked real. It seemed to work. I'm sorry if this wasn't helpful. Not what I had in mind. I still appreciate the information NeverCeaseToCrease . Don't know if you still want an answer, but a final diameter of 1.4cm to 2cm is quite pleasing to the eye. Thank you Grace . Actually, I folded them quite some time ago. Nativity Stable, created by me in 2011. -Wrapping paper made from brown kraft paper. -It has clear nail polish coatings. Boxed Fortune Teller, created by me in 2015. -Handmade paper made by the origamist Fabian Correa. -It has PVA wood sealant coatings. These are very nice. I like the nativity stables for their distinct look. 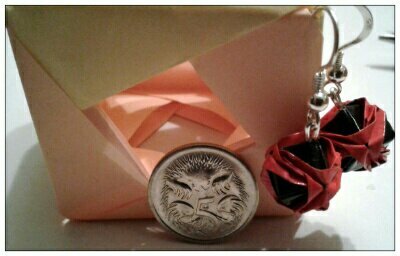 Ishibashi Minako's origami brocade is my favourite to turn into earrings. This is a colour variation of my own design. Thank you for the picture and the compliment. Love the earrings! I had not thought of modular models as earrings . English is my second language, sometimes I don't get an expression or two. What do you mean by the "distinct look" of the Nativity stable folds? Earrings move around as they are worn showing different sides of the model. Your nativity stables will still look like nativity stables from a distance and from different angles. It is an elegant design.